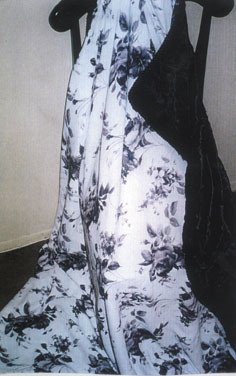 Roses and leaves are depicted intricately in tones of gray and black on a field of white crepe rayon. The other side is shimmering black seal faux fur. This lightweight throw has red rose clusters on a field of black, backed with red satin. 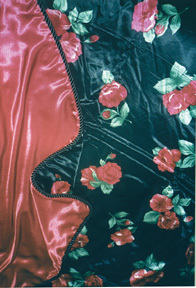 Our Tropical Blossoms lap robe has a striking floral print on black showing a variety of boldly colored blossoms. 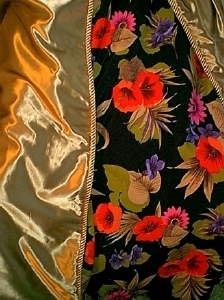 The lining is lightweight gold satin. 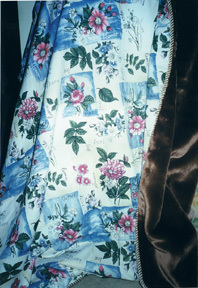 Pink rose clusters decorate a painterly patchwork design of white and blue. The lap robe is lined with brown sheared beaver faux fur. 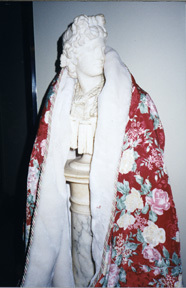 Large white and pink rose blossoms adorn a field of red, backed with snow white faux fur.